Sitesafe AM Tower Screening - A Free Service from Sitesafe, LLC. Welcome to the Sitesafe AM Tower Screening tool! The antenna structures of wireless sites can alter the antenna radiation patterns of nearby AM broadcast stations. The FCC requires that at the time of new structure construction or significant modification of existing sites, wireless operators demonstrate that their site(s) do not adversely affect the patterns of nearby AM stations. The FCC mandated zone of required protection is a radius of 1 wavelength determined by the AM station’s frequency for AM stations using non-directional antennas (single AM towers), or a radius of 10 wavelengths or up to 3 km whichever is less for AM stations using directional antennas (multiple AM towers). All towers detuned for AM station(s), regardless of distance, are regulated and the detuning equipment must be maintained and in proper adjustment. In order to ease the "AM Screening" process, Sitesafe has created this free screening service. Using data from the FCC's database, we display any and all AM stations in the vicinity of the entered coordinates. Vicinity means 3.2 kilometers (km) from a directional AM station and 1.2 km from a non-directional station. If no stations are in the vicinity a Negative AM Certificate is made available for download, no further action on this structure is required. If a structure is in the vicinity of an AM station further information is requested. This is used by Sitesafe staff to determine if any action is required under the FCC regulations. 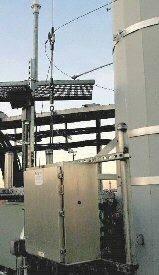 Factors such as height change, distance and status of any detuning on the tower determine the action. If no action is required a No AM Action Letter or a Negative AM Certificate is generated and sent via email. If action is required, Sitesafe will provide a proposed scope of work to ensure FCC AM rules compliance. Because we rely solely on the FCC's databases and user input, Sitesafe cannot assure accuracy of the data you are about to receive. Sitesafe makes absolutely no warranty, statement or claim as to the accuracy, fitness of use, content, repeatability, purpose of use, completeness, timeliness or application of this data. Sitesafe, LLC. offers complete AM detuning services to the entire communications industry. Please call us at (703) 276-1100 if we can assist you in any way. Register to get a FREE login name and password! Copyright © 2019 Sitesafe, LLC. All rights reserved. All trademarks acknowledged. All information considered proprietary and confidential.